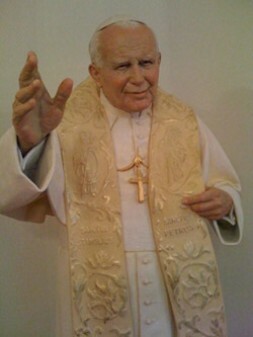 "John Paul II lived in God. He was looking for thoughts and God in daily life, made people happier and talked to everybody by addressing the young people. 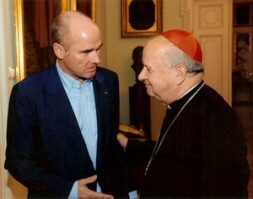 It was not so much his great personality but his living-in-God that made him strong and influential", Dziwisz told a meeting of YPO members organized by European Chairman Przemyslaw Aleksander Schmidt, who is also a member of the WSN International Advisory Board for Poland. As a defender of human rights he was a rock standing against inhuman communism in Poland. This power of high moral authority was seen as a threat by the KGB, who tried to eliminate him in a failed shooting attempt on Saint Peter’s Square by a Bulgarian professional killer. This statue of Pope Johannes Paul II in his former residence as cardinal in Krakow stands in the large reception room where he was trained as young priest in the underground seminar in World War II, worked as a cardinal and visited his city many times.